Seawater corrosion resistant piping systems for large diameters up to 100”/ 2.5 meters O.D. OSNA® -10 Copper-Nickel Lined Pipes are the most cost-effective, long-term alternative to conventional steel piping systems. Seawater, with its various compositions, temperatures and biological diversity is known to be one of the most natural corrosive mediums for most materials. Seawater carrying systems made of steel pipes present a challenge to the engineer to overcome the problem of corrosion. In addition even if they are lined with a corrosion resistant liner they can also suffer the problem of marine growth, or so called biofouling. This problem increases the static loads on the pipe line and increases the flow resistance inside the pipes, to prevent this problem additional protection solutions are necessary in form of chlorination or costly coating systems. These two problems present a unique problem to the metallurgist as there is not one single material with these properties. A composite-material solution is the obvious choice, but the selection of appropriate materials that will give sufficient performance at reasonable cost is absolutely crucial. Conventional metallurgical bonded copper-nickel 90/10 lined steel pipes have been proved to provide a cost-effective solution which meets the technical and cost requirements, but a major downside is the limited availability and long lead times. By joining together KME’s technology with our OSNA®-10 copper nickel 90/10 alloy and Bergrohr’s innovative manufacturing process BERG-LAY® we have produced a new concept in steel lined pipes which are a cost effective solution for sea water piping systems. The processing of two plates together to form a pipe using a carbon steel plate and a separate plate made of OSNA®-10, results in a new kind of composite pipe. 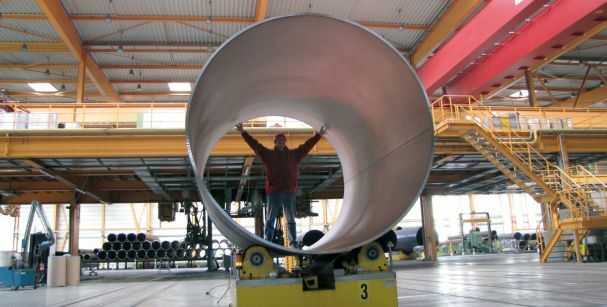 Bergrohr’s innovative manufacturing process results in a pipe with a pressure-resistant outer surface with a permanent bonded corrosion proof and biofouling resistant inner-lining. With this landmark concept, KME present a new kind of copper-nickel pipe for seawater applications with previously unrivalled qualities.